US, 1951, 104 minutes, Colour. Humphrey Bogart, Katharine Hepburn, Robert Morley, Theodore Bikel, Peter Bull. 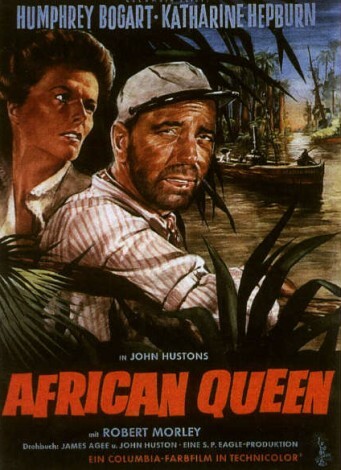 The African Queen is now considered a classic: a good story, good adventure and patriotic, humane theme. These were the days when John Huston was a great director (The Treasure of the Sierra Madre, 1948), when Humphrey Bogart was a great actor, (he won the Oscar for this performance), and when Katharine Hepburn continued to be great. Robert Morley is as usual in the early part of the film. Indeed, all the ingredients are good and the film is a success. 1. Did you see the film solely as a comedy? adventure or was there more to it? If so. what? 2. How well was the pre-1914 African setting evoked? 3. What was the atmosphere of this mission, the natives, the heat, the camera's attention to Rosie at the organ, the hymns, her brother? Was this an effective mission station? Why? 4. How did Charlie Allnut and the African Queen contrast with Rosie, her brother and the mission? what kind of world did Charlie represent? How did the comedy of the meal, stomach rumbling etc., establish the characters. contrast them and prepare for the journey and their adventure together? 5. What was the impact of the news of the war in the middle of the jungle and then its sudden eruption in their midst with such destruction? 6. How sorry were you for Samuel and the destruction of his life's work, the pathos of his insanity and death? 7. How do you explain the transformation of Rosie? Why did the adventure exhilarate her (the plans for torpedoing, the rapids)? Were you exhilarated? How dangerous was it? 8. Was Rosie motivated by revenge? 9. How did Charlie’s and Rosie's relationship develop? Was this well and convincingly portrayed? Who dominated whom? How did love develop? 10. What did the film have to offer on the theme of heroism and courage? Did it overplay the heroism or make it realistic, e.g. the rapids, passing the German fort. dragging the boat through the mud? 11. Was the finale on the lake too melodramatic or was it successfully filmed? 12. Was the trip worth it for the war effort? 13. Had the explosion not been successful, would the trip still have been worth it for Rosie and Charlie? Why? 14. How humane was this film? How optimistic and encouraging? Why?